Over 50 local and international video artists have each contributed one hundred and twenty seconds of pure, uncut video art for Federation Square’s Big Screen on Thursday 11 April from 6-8pm. Adele Varcoe, Amelia Johannes, Antti Leppänen, Arlo Mountford, Bonnie Lane, Brendan Lee, Bridget Walker, David Anthony Sant, Dong Jing, Electronic Migration Panel, Emma Hamilton, Evangeline Cachinero, Georgie Mattingley, Georgie Roxby Smith, Gianni Wise, Goran Tomic, Guo Hao, Hamishi, Hayley Brandon, Hayley West, Hugo Egan, Inez de Vega, Jani Ruscica and Sini Pelkki, Jenny Mai Hall, Kieran Boland, Kieran Mangan, Geoffrey Ricardo, Kit Wise, Kotoe Ishii, Masonik, Mia Salsjo, Michael Meneghetti, Nicola Page, Nikki Lam, Pabi Chulo, Paulo Ahumada Rovai, Pierre Proske, Pip Ryan, Robin Hely, Scot Cotterell Simon Finn, Sun Huiyuan and the Double Fly Art Center, Tara Cook, Tony David Woods ...with more yet to be announced. 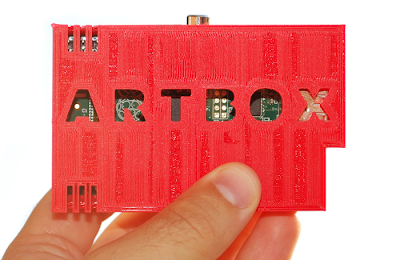 Artbox is the world's first portable video art player, curating exclusive artworks from around the world to your private and public art spaces. They are launching their Pozible campaign on April 11 and appreciate pledges of all kinds. Please come and enjoy this incredible show with Artbox.